Hey, I haven’t been here much and I am having blog-guilt, but we all have to get over that eventually. 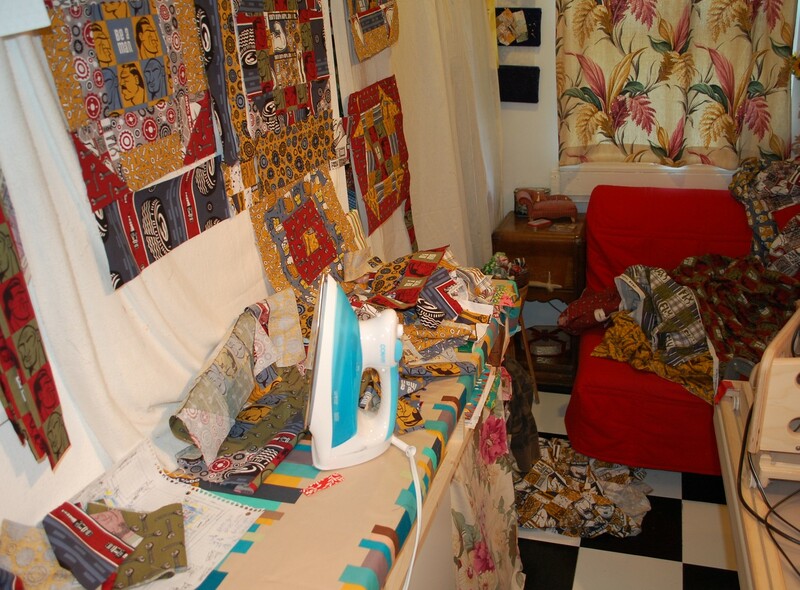 I have been sewing like mad, besides going to work and all the rest of everyday life (why do we have lawns that have to be mowed again? oh right…no time to build a fence and keep sheep and goats!)….. 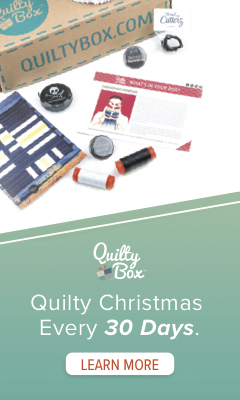 The Christmas Snowflower quilt from last post still needs to be quilted, and the second project I am working on is for Free Spirit’s booth at Market and is being created with Be A Man, a new line by Douglas Day. So this will be brief….just some pictures and then I am outta here folks….only 10 days til I leave for Market…and I am going crazy with excitement and stress on trying to finish it all! 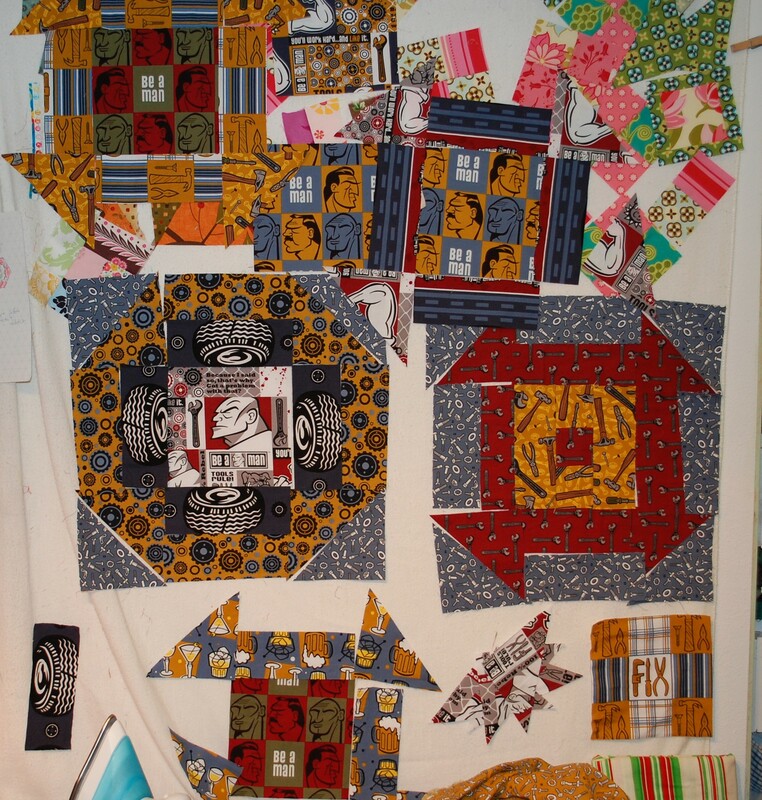 I decided to go with a simple block with an appropriate name–Monkey Wrench….should I call the quilt Be a MonkeyMan? Maybe not…but kinda funny, I think….okay maybe not, maybe I am just delirious with too much going on, n’est pas? these fabrics are Great I think, but the values are a bit difficult to work with….there aren’t enough lights, and not quite enough darks for my preferences…..but oh such fun fabric for gifting to men…particularly in the 18-30 age group….I can so see this fabric in college dorm rooms….and on little boys if you ditch the beer fabric of which there is only one print…that print is what makes me think of the older males….Frankly I don’t even like beer, but I know that beer is a problem for a lot of young men who lack some self-control….me? I lack self control in chocolate chip cookies and fabric and various other areas….but I am not your “typical” American male…. Hope you all like it, and I hope to bring you some more posts before Market, but I am scrambling like I said to get a bunch done. I will be taking the red-eye flight across the country in a week and a half….wondering how much I can get done between now and then….and can I work on some of it on the plane? So what are the rest of you out there up to?? 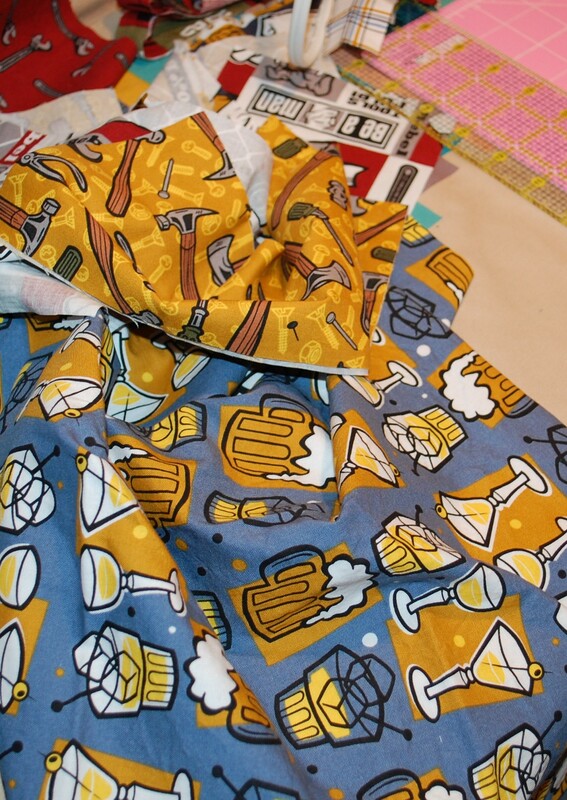 I like these fabrics more than I thought I would. 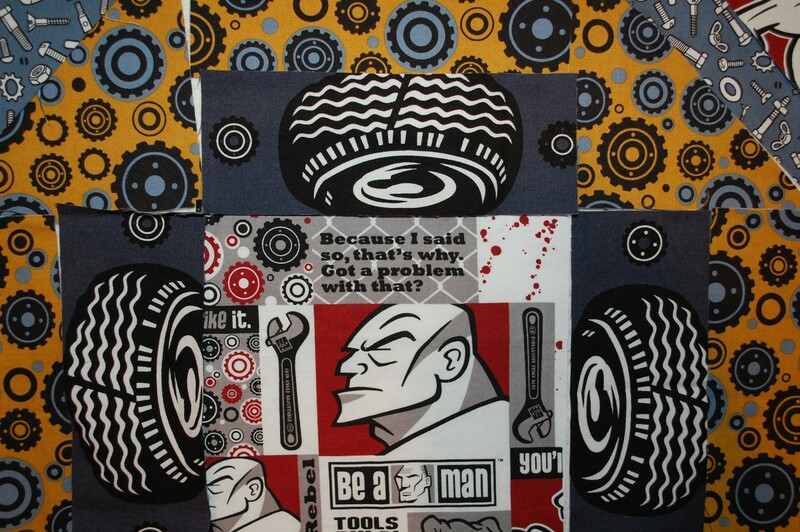 Particularly the gears and the tires. And I like how you fussy cut them in some cases… especially those tires. I would find them difficult to work with too, but I think it’s coming together nicely! 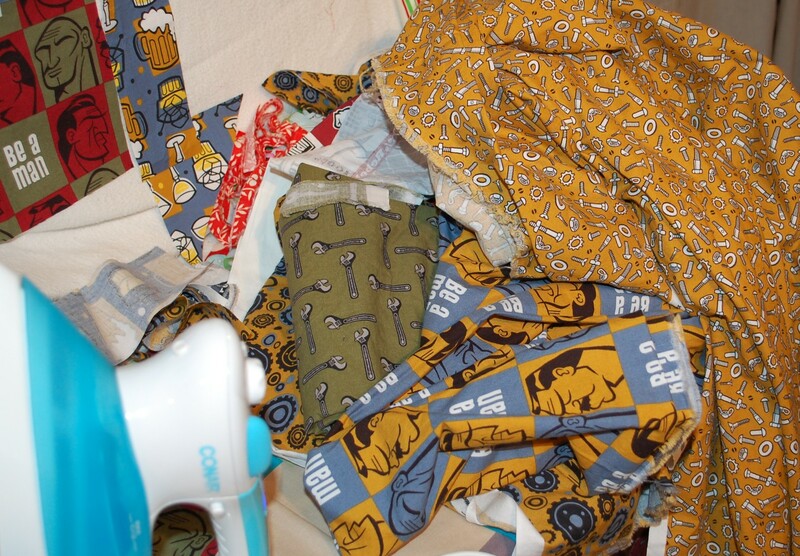 Now back to my own sewing…. Hysterical. Love the ‘man fabrics’. That fabric makes me laugh! 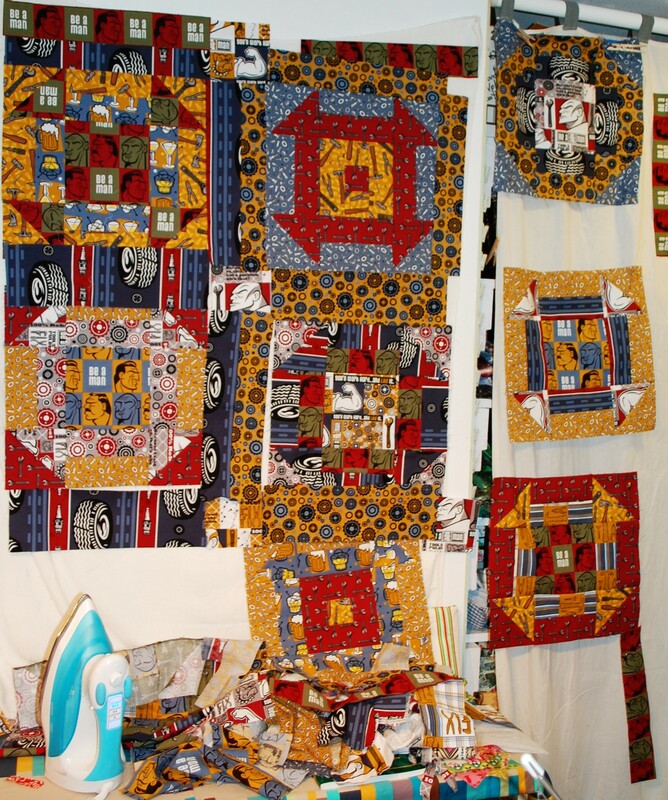 The quilt looks great, it will be fun to see the finished project!! SEW ON! that quilt came out fab!! Thanks, Jennifer! 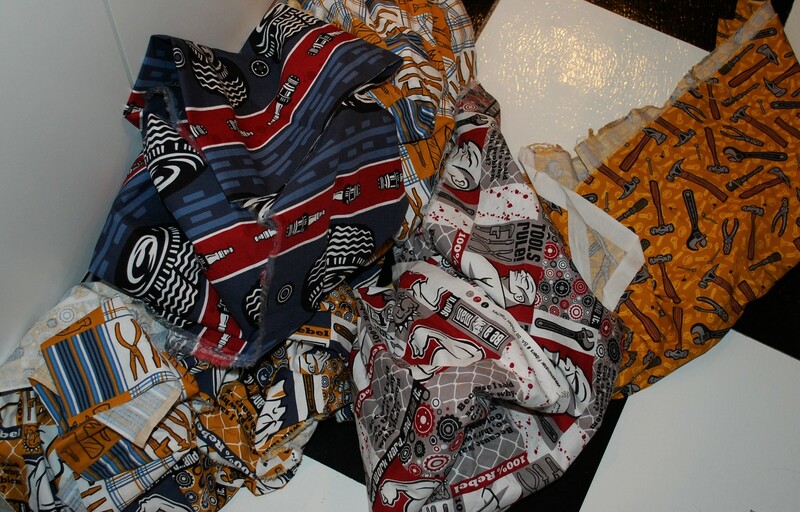 It would look good in your fabrics too I think!